DHAKA, May 27, 2018 (BSS) - The United Nations World Food Programme (WFP) has welcomed over US$490,000 from France to support life-saving nutrition activities for Rohingya in Cox's Bazar. France's contribution will help prevent and address moderate acute malnutrition among children under five and pregnant and nursing women living in Rohingya settlements in Cox's Bazar, a WFP press release said today. As part of this support, WFP provides super cereal, a fortified nutritious porridge, along with training on good nutrition practices. "We highly appreciate the positive impact for children and women from the nutrition programme and training conducted by the World Food Programme, with our €300,000 contribution in 2017," said Marie-Annick Bourdin, Ambassador of France to Bangladesh. "France hopes that its 2018 support will further benefit both Rohingya and local communities exposed to moderate acute malnutrition and warmly thanks WFP for its continuous efforts," she added. More than 5,000 children under five and 1,100 pregnant and nursing women in the Rohingya settlements of Cox's Bazar will benefit from France's support for this nutrition programme. In welcoming France's contribution, WFP Bangladesh Country Director Christa Rader said, "The nutrition situation in the camps remains critical. This is of particular concern for young children, nursing mothers and pregnant women. France's contribution will help us address this situation." 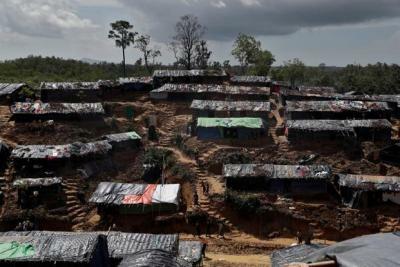 Almost 700,000 Rohingyas have fled violence in Myanmar since August 2017, resulting in about one million Rohingya people living in Cox's Bazar district. Surveys conducted in late 2017 showed that malnutrition rates in these Rohingya sites are above the emergency threshold of 15 percent. The surveys also indicated that nearly half of children suffer from anaemia. In Cox's Bazar, WFP provides supplementary nutritious food to nearly 163,000 pregnant and nursing women and children under five.